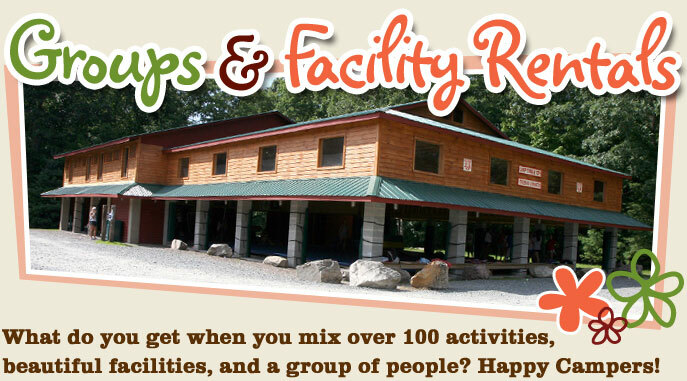 What do you get when you mix over 100 activities, beautiful facilities, and a group of people? Happy Campers! Adventure programs can be the catalyst for development, creativity, and change within any organization. Camp Timber Tops offers high and low ropes courses, climbing walls, zip lines, canoeing, river rafting, biking, and hiking adventures. Our Outdoor Education program offers a customizable curriculum. Spend a day or a week learning about everything from flora and fauna to water quality and weather. Ask us how a customized adventure or outdoor education program would enhance your stay at Camp Timber Tops. Are you looking for an experience that will rejuvenate your employees? Does your staff need a break from the corporate routine? Do you want to provide distraction-free training for your business team? Strategize and energize with us in a beautiful wooded setting. Camp Timber Tops is a break from the "cubicle" environment. Breathe in that fresh mountain air. Enjoy the sight of a billion stars. Take a walk where pine needles cushion your step. Our meeting space can be equipped with audio-visual and internet capabilities so that you can take productive advantage of our relaxing and beautiful location. Whether your group is a marching band, martial arts school, family reunion, church camp or business group, the facilities at Camp Timber Tops can provide a setting for fun, learning and memories. Indoor and outdoor facilities can comfortably accommodate 75 to 500 people. Our capable and friendly staff can provide additional activities involving adventure, aquatics and environmental education. Top it all off with s'mores around the campfire and you'll have planned the best retreat ever. Contact us about your group's needs. We have a custom plan that will work for you. Our resident chef and his staff will prepare all of your meals based on a menu that you create. You can eat either buffet or family-style in one of our dining facilities or at one of our outdoor picnic groves. Don't worry about special dietary considerations. Just let us know what you need and we'll be happy to accommodate you. You'll feel cozy in our cabins. Each is equipped with private showers, sinks and toilets. A limited number of private rooms are also available.